So here we are calling grandpa to prove that Chen Che is not a liar. Lucky for Chen Che, grandpa does not answer, but don’t sigh with relief yet because Ya Juan suggests they go over to her house to check with grandpa in person. Uh-oh, someone’s pants are about to catch on fire! Or not. Grandpa covers for Chen Che by saying they met in America, and when he learnt that the latter is a stock expert he asked Chen Che to please open an account on his behalf. As to why he didn’t tell Ya Juan? Well, he wanted to save up some secret money and hide it away from his wife. Wow, gramps, you sure weaved a lie rather quickly! Turns out it’s not the first time Chen Che and grandpa met. Chen Che had revealed the truth about his time traveling and his relationship with Ya Juan to grandpa at an earlier meeting. Oh and he proved it through his picture-taking phone. Man, this phone is so useful. Back to present day, grandpa invites Chen Che to move in with the family, but the latter declines, saying he is fine at Zhen Zhen’s. Though at first Chen Che is unsure himself why he refused such a great opportunity to be with his loved ones, he finally figures out that it’s because he would miss having Zhen Zhen around. Ohy, finally, I thought we would never get here. Is there a reason why people in dramas are always so slow? Anyway, Chen Che does agree to be Ya Juan’s English tutor and the two decide to meet up at the library. Before Chen Che arrives, Jin Qin drops by and the two lovebirds coup up behind some shelves to have a little rendezvous. Guess who sees this? Our favorite stalker, Chen Che. Is there anything more weird than spying on your supposed parents as they make out? Remember how Chen Che realizes that he will miss Zhen Zhen if he moves out? Well, he is definitely feeling how important she is when he mistakenly thought she got into a car accident when he saw her scooter bike on the ground outside her residence. And cue scenes of Chen Che going ZOMG where are you Zhen Zhen!! Have no fear though, Zhen Zhen is actually perfectly fine. She was just helping some other girl who actually got into an accident and the scooter bike fell over somehow. Nothing to worry about, Mr. Chen! 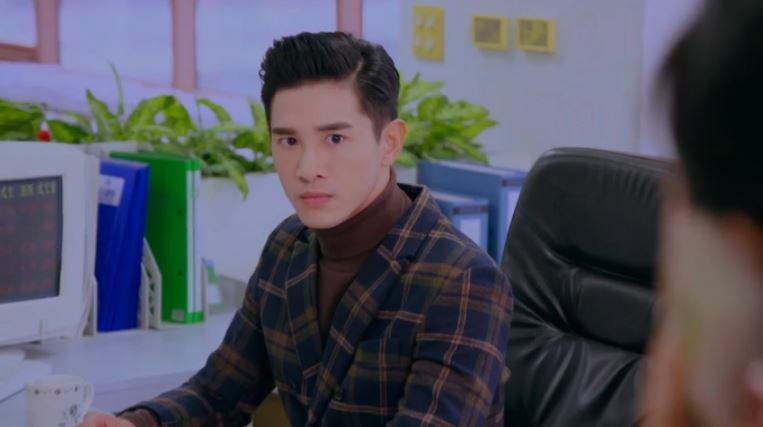 Now that Chen Che finally admits that he likes Zhen Zhen, he even heads back to the office after a client meeting to pick her up from work. Annnnndddd he totally puts the moves on her while walking home. I guess this means they are official? Well, just as I thought things are looking up for the Chen-Zhen pair, grandpa comes in to tell him to watch his actions because anything now can affect the future. Also, grandpa is shocked to learn Chen Che is born in 1990 because it’s already the end of 1989. Yikes! A sad Chen Che returns home to find Zhen Zhen still working on those string lights her mom brought home to put together for extra income. He brings up the fact it’s almost year-end, and she gets super excited about Christmas. So excited that she insists they hang up the lights and do a countdown because apparently that’s what people in Western culture do? Uh… I’ve never done that before. Anyway, they light them up and stand under the twinkling lights as Zhen Zhen sings the Holy Night. We got the background music and all so the scene is not as awkward, but imagine just standing there – it’s really kind of weird. Things people do when in love! After much festivities, Zhen Zhen falls asleep on Chen Che’s shoulders. While sleeping, he leans over and ta-da! Zhen Zhen almost figures out that Xiao Long likes her, but he quickly adds that he was suspicious of Chen Che because he was concerned for her whole family. Ya Juan promises Jin Qin that she won’t fall in love with anyone else, even if it’s Tom Cruise! A client catches Xiao Long trying to gift Zhen Zhen a gift and teases the latter about how cheap it is. This client works for a rich man Wang, and he promises to help Xiao Long get some stocks. Uh-oh, I don’t have a good feeling about this. Catch episode 10 of Back to 1989 on Viki now!